Newspaper publisher Trinity Mirror has sold the Racing Post to an Irish investment firm for £170m as part of a planned shake-up. The group said it will retain its regional titles in the Midlands and the South East because the offers it received did not reflect their value. The Racing Post will be taken over by FL Partners, a Dublin-based private equity group. The sale comes amid falling advertising and circulation revenues at Trinity. Trinity Mirror said that conditions in debt markets following the recent credit crunch had limited potential bidders for the firm's regional titles that include the Birmingham Post. The group said in December last year that it planned to sell off the Racing Post and a number of regional papers. It said it would instead focus on national and regional newspaper titles in Scotland, the North of England and Wales, and UK digital assets. 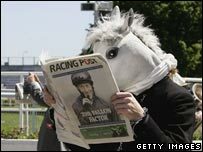 Chief Executive Sly Bailey said that the sale of Racing Post would likely be the last in its disposal process. "The process will enable Trinity Mirror to go forward as a more tightly-focused media group, which is nimbler and more able to respond to the opportunities in its markets." Shares in Trinity Mirror were up 0.5% or 2 pence to 414p in Monday morning trading in London.